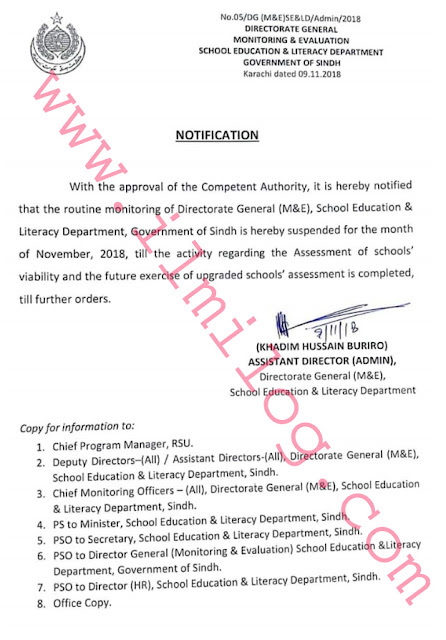 A Notification No.05/DG (M&E) 5E&LD/Admin/2018 by directorate general monitoring & evaluation school education & literacy department government of Sindh Karachi dated 09.11.2018 has issued regarding School Based Assessment Suspended for November 2018 School Education Sindh. With the approval of the Competent Authority, it is hereby notified that the routine monitoring of Directorate General (M&E), School Education & Literacy Department, Government of Sindh is hereby suspended for the month of November, 2018, till the activity regarding the Assessment of schools' viability and the future exercise of upgraded schools' assessment is completed, till further orders. Copy for information to 1. Chief Program Manager, RSU. 2. Deputy Directors—(AII) / Assistant Directors-(All), Directorate General (M&E), School Education & Literacy Department, Sindh. 3. Chief Monitoring Officers — (All), Directorate General (M&E), School Education & Literacy Department, Sindh. 4. PS to Minister, School Education & Literacy Department, Sindh. 5. PSO to Secretary, School Education & Literacy Department, Sindh. 6. PSO to Director General (Monitoring & Evaluation) School Education &Literacy Department, Government of Sindh. 7. PSO to Director (HR), School Education & Literacy Department, Sindh. 8. Office Copy.